The creative uses of LED lights never cease to amaze us. Whatever the setting, the effects that can be achieved with a combination of lights and structures make for endless possibilities. 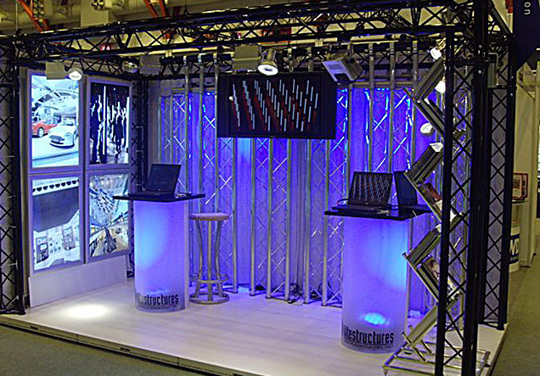 In particular, using the right LED trade show lights for your booth can add drama and intrigue that will attract more people to your display. 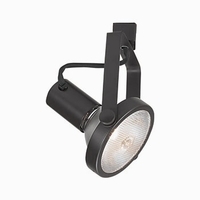 We’ve put together a few real cases of how trade show lighting fixtures have been enhanced using LED. 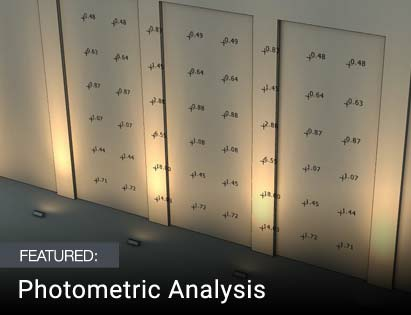 Case in point: This dramatic booth was created with a mix of lights and geometric structures for maximum impact. What really sets it off, however, is the backdrop of purple LED rope lights fashioned in a grid behind the steel cylinders, which serve as reflectors. The effect is enhanced by the identical shade of purple lighting used by LED wall wash fixtures in the translucent cylindrical podiums supporting the laptops. This is a perfect example of how trade show track lighting can amplify a booth and draw attention even when using a single color. 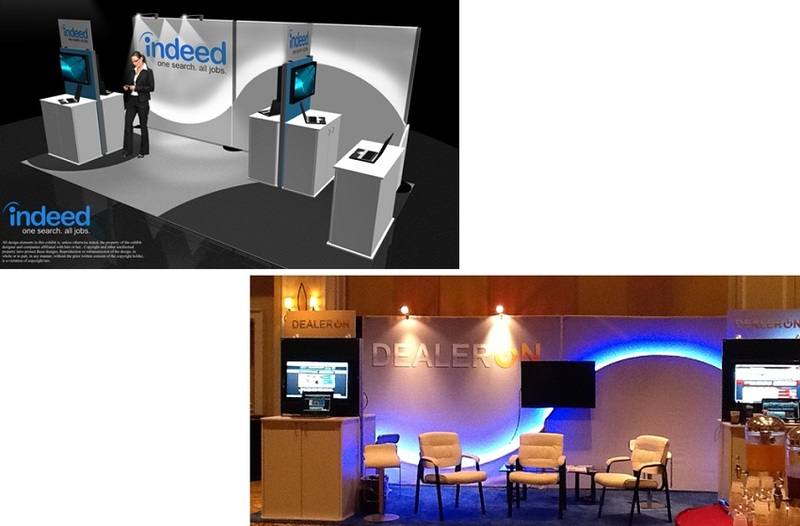 Here’s another great trade show booth using a somewhat similar technique for a completely different effect. The pink LED rope lights are crisscrossed up the drapery supports and accented with wall wash up lights. This creates a soft mood lighting that not only defines the space, but elevates it above its surroundings, making it almost ethereal. The lights bounce across the space, coloring the white gauzy draperies and being reflected in the glass tabletops. The curved white sofa sections reinforce the boundaries of what seems to be a heavenly little retreat. 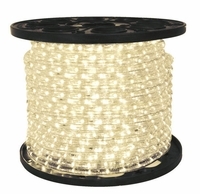 LED rope lighting can even be used to dramatize more businesslike displays. Here is a superior example of blue LED lighting used to accent the curved standout in the back panels of the booth. To see the incredible difference that this one rope light makes, just compare it to the grayscale image in the upper left corner. 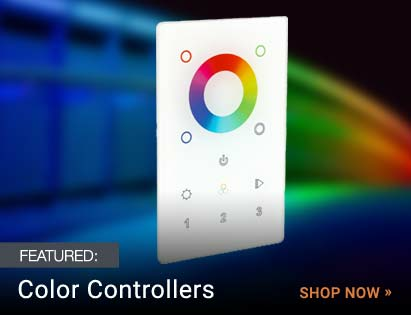 The effect is eye-catching without being overbearing. 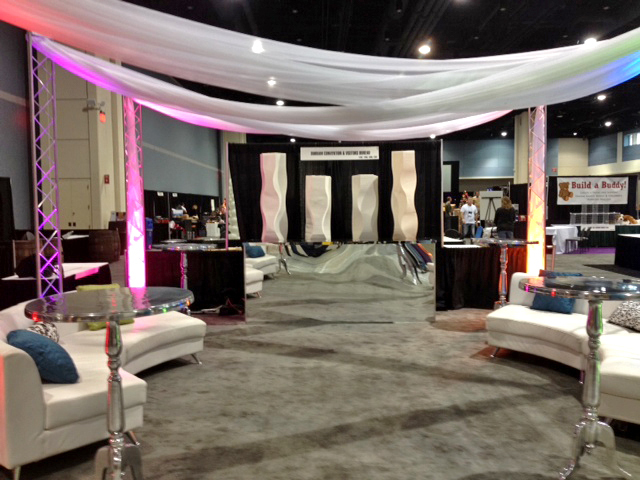 Once you look at it and absorb the effect, you are free to let your eyes wander over the other elements of the booth. Another clever aspect of this display is the stage setting. To sit in one of the chairs would create the impression of being on a talk show, not an unpleasant situation for business people who have ideas to share. 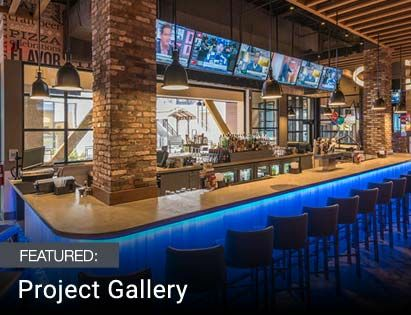 Trade show booth track lighting, wall washing, and rope lighting are just a few of the LED lighting methods that can be used to augment architecture or serve as their own dramatic design element. 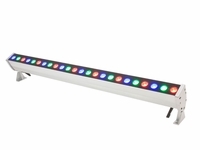 We hope these examples give you a few ideas for using LED lights in your next trade show. Contact Take Three Lighting for additional inspiration and assistance.